Forges was founded in 1994, and it is specialized in the production of forged parts based on customers design from 0.5 to 45 tons. 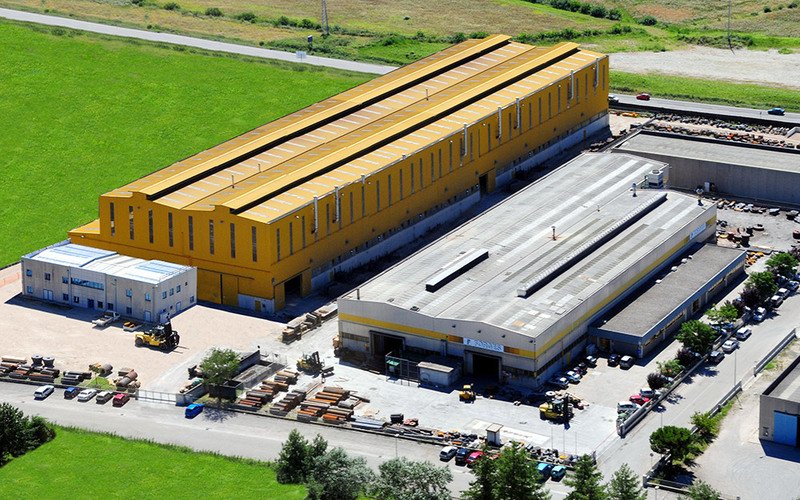 Manufacturing site is located in Cividale del Friuli, lying over an area of 40.000 m2, which 20.000 are roofed. The plant is equipped with 2 presses up to 5.000 tons and 4 heat treatment furnaces. Forges can supply forgings for several applications such as naval, gearing, off-shore equipment, paper, oil & gas, siderurgical industry, cement and mechanical industries as well. Forges constantly growing client base has allowed the company to invest in major plant improvements which led to a big increase of production capacity, both in terms of quality and weight. Furthermore, enhanced production management systems allow FORGES to deal ever more effectively with growing demand in terms of deliveries and responsiveness. Providing the best quality ever is Forges main commitment. The company has its own destructive test laboratory and qualified personnel and equipment to perform visual inspection, magnetic particle, ultrasonic and dye-penetrant testing of forged steel products. Forges operates an integrated management system in compliance with ISO 9001:2008 as certified by DET NORSKE VERITAS, being approved for the supply of forgings for naval industry according to worldwide certifying agencies.